From eating in random living rooms to five star meals, here are some of the best Vietnamese street foods and snacks we tried, while traveling through Vietnam. Vietnamese food is without a doubt, one of our favorite cuisines. We love it's creative ingredients, and that mix of sweet, sour and spicy flavors! Although we were excited to visit Vietnam in general, we were more excited to taste everything and eat our way through the various cities we were visiting like Hanoi, Hue, Hoi An, and Saigon. Of course, being a huge country, the various regions of Vietnam (north, central, and south) each had their own unique food styles. We felt lucky that over the course of three weeks, we'd have the chance to try the food from so many different parts of the country. No matter where we went, we were able to find vietnamese staples like Pho and Bun Cha, but we were surprised by the variation from one city to another -- for instance, the Pho you order in Hanoi is almost completely different from the Pho you'll get in Saigon. Another thing that surprised us was that each of the three regions we visited had very different dining cultures (at least from what we could tell). In Hanoi, the north of Vietnam, the places we ate were basically "mom and pop" street food stalls. In Hue and Hoi an, the central region of Vietnam, things were a little more developed, and we found a broader selection of traditional restaurants. In Saigon --Vietnam's largest city -- we were able to find everything from amazing street food to fine dining all on the same street. Below are a few tips for eating some of the best Vietnamese food we tried, while on our 3 week tour of Vietnam in July 2014. I know we are missing a ton of dishes on this list, so let us know about your favorites in the comments! Be adventurous: Many restaurants in Vietnam (especially Hanoi) don't always look like traditional restaurants in the US or Europe. Sometimes, the "restaurant" is the front room of someone's house, and they serve food to you in what is essentially their living room. Sometimes the "restaurant" is just a grill setup over an open fire on the sidewalk. If you see people sitting on little plastic stools, go ahead and join them. We did this many times, and had amazing meals, and never died. It's perfectly safe. 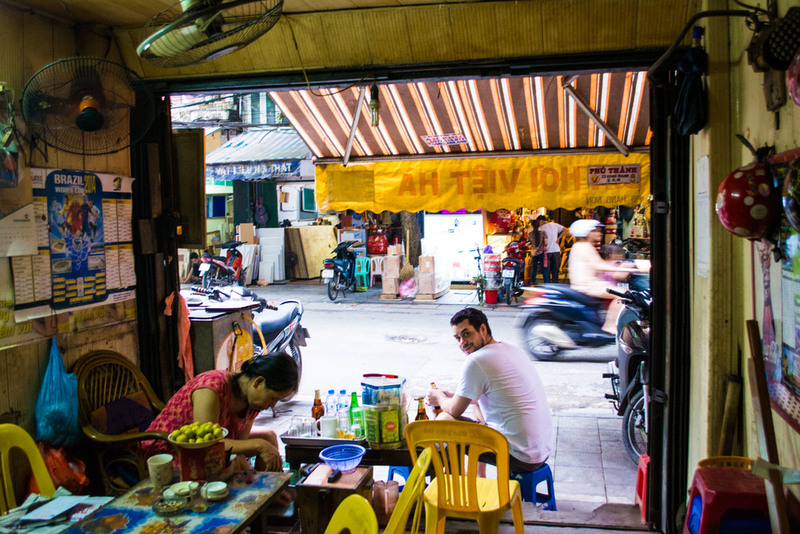 Look for locals: This golden rule of eating in a foreign city applies anywhere, but especially for Vietnam. If you look into a place and see nothing but wide eyed westerners looking back at you, run away. Often times this tactic does mean that you will end up going into places that may appear to be less than "100% sanitary" (though you'll get over that quickly in Vietnam), and they most likely will not have a translated menu for you. Deal with it. Find someone who is eating something that looks good and point to it when you order. Odds are you'll get delicious, authentic food, and for a fraction of what you'd pay in a restaurant that caters to foreigners. Don't always expect to get a menu: Many places we ate in Vietnam only served 1 dish. You basically walk up, grab a stool, and within 30 seconds someone walks over and puts down a bowl or plate of what ever it is that restaurant makes. It could be skewers, bun cha, pho, or something else you may not always recognize - but whatever it is, that's what you're going to eat -- there are no substitutions. Drink beer: It's hot in Vietnam, and nothing helps cool you down like a glass of beer. You'll see it for sale everywhere. We bought some from an old lady selling it out of her house, and we sat with her on little stools on the sidewalk and drank a few bottles. Also, a bottle of beer is cheaper than a bottle of water in Vietnam, use that to your advantage -- and remember beer is 95% water anyway! Cheers! Speaking of Beer, try Bia Hởi This is a dirt cheap local style of Vietnamese beer. Expect to pay a few pennies for a glass. Bia Hởi literally means fresh beer. It's brewed each the morning and is sold later that day! Don't be turned off when you see it served with large amounts of ice. It's surprisingly refreshing and when it's hot and humid (even inside the air conditioned rooms), you'll be thankful. Sometimes you just need to stop for a beer in the most unexpected of places! Bun Cha- The signature dish of Hanoi. Follow your nose to a smoky street-side grill and chances are you’ll find Bun Cha. You’ll be given a mound of grilled pork neck, fried spring rolls, salty-sweet broth, slices of green papaya, rice noodles, and fresh herbs. Mix everything together and enjoy. Morning Glory Salad - Although we found this everywhere in Vietnam, we first tried it in Hanoi. It’s a crispy vegetable that is stripped down to be noodle like and we ate in variety of different ways. My favorite was eating it raw with grilled beef on top and that tangy sweet sauce, Vietnam does so well. Phở - There is a big difference between Phở served in Hanoi and Saigon. In Hanoi you get wider noodles, a darker broth and my favorite - a strong anise and cinnamon flavor. If you’re used to getting all the different garnishes (herbs, lemon, different types of meat, etc) you’ll have better luck in Southern Vietnam. Che Thap Cam / Red bean, Ice Drink - A little bit of column A and a little bit of column B—that’s the gist of che thap cam. Whatever the dealer is selling, she’ll spoon in a smidgen of each. You’ll most likely receive layers of beans, jellies, tapioca, coconut milk, shaved ice and more beans. Cao Lau -This is probably one of the most famous dishes to come from Hoi An. It’s a pork noodle soup made with fat yellow noodles, slabs of tender pork, bean sprouts, fresh greens and crispy croutons. What makes this dish special is the noodles must be made with the water from one of the closely guarded ancient Cham wells hidden throughout Hoi An. Banh Bao Vac - A delicious shrimp or pork dumpling that when steamed looks like a white rose. Topped with crispy shallots and a tangy dipping sauce, this is one of my favorite appetizers. Com Ga Hoi An - Otherwise known as chicken rice and pretty much available at every restaurants. Central Food Market - Although we didn’t get to visit this so called "foodies paradise", we had heard enough good praises from credible sources, that this is the best place to sample all of Hoi An’s unique dishes. Banh loc tran - What I conside the equivalent of the Banh Bao Vac (white rose dumplings) of Hoi An. These dumpling like ravioli's are made with a tapioca flour-based dough and stuffed with a generous portion of shrimp and pork. Banh Beom - Steamed rice cakes, that are topped with dried shrimp, pork cracklings, shallots and herbs. Banh Khoai - Banh khoai literally means “delicious cake” and is served open face. The crispy pancakes are traditionally filled with pork, shrimp and sprouts serve with fresh greens and fermented soy bean peanut sauce. Mystery Chicken - I'm not sure exactly what we ate, but one afternoon our tuk-tuk driver took us into a food market in Hue, where we were led to a pair of small plastic stools sitting in 2 inches of some rancid looking water. At first we were a little unsure, but after noticing we were surrounded by 10 other Vietnamese locals all chowing down, we decided to give it a go. It's a good thing we did, because next thing you know the woman reaches over and gives us 4 skewers of mystery chicken (at least I think it was chicken). Honestly it was so good that we ended up ordering many more skewers, and after a few cans of Huda beer, we didn't even care if it was chicken or not, as it was so damn good. We nabbed these two seats in a food market in the center of Hue. Bun Thit Nuong Cha Gio - A combination of grilled meat, fried spring rolls and sweet and sour sauce all on top of rice vermicelli noodles, fresh lettuce and herbs. Best served street side on a child’s stool. Phở - The Phở served in Saigon seemed to come in much larger bowls, smaller noodles and with all the delicious accoutrements I could want - mint, cilantro, bean sprouts, sawtooth herbs, lime and hoisen sauce. Ca Phe Da - More commonly known as Vietnamese IcedCoffee.You can find this almost anywhere in Vietnam and it’s so much more than just coffee. It’s dessert, it’s energy, it’s just delicious! It’s made with coarsely ground Vietnamese-grown dark roast coffee, individually brewed with a small metal French drip filter. It's then poured into a cup containing as much sweetened condensed milk, stirred and poured over ice. Chris drank like 4 of these a each day. Square One Restaurant - Ok, this one is not a dish, but an actual restaurant. Located inside the Park Hyatt hotel, this was one of the best meals we had in Saigon. We wanted to dress up a bit and see what the fine dining scene was like in Saigon. With an open kitchen and chic decor, we dined on authentic Vietnamese dishes and had great wine and cocktails. We ate at this make shift sidewalk restaurant three days in a row. Each meal cost $1 USD per person.